On the day of Donald Trump’s inauguration, Netflix announced that the fifth season of House of Cards would air on May 30. This was no mistake. The similarities between Trump and House of Cards’ president Frank Underwood as played by Kevin Spacey have attracted significant attention. In fact, Spacey somewhat jokingly remarked that when he speaks directly to the audience, the one person he is addressing is Trump. In the series, considered by some to be the most popular political drama on Western TV, carnivorous tastes initially mark protagonist Frank Underwood as a man determined to be at the top of the food chain. 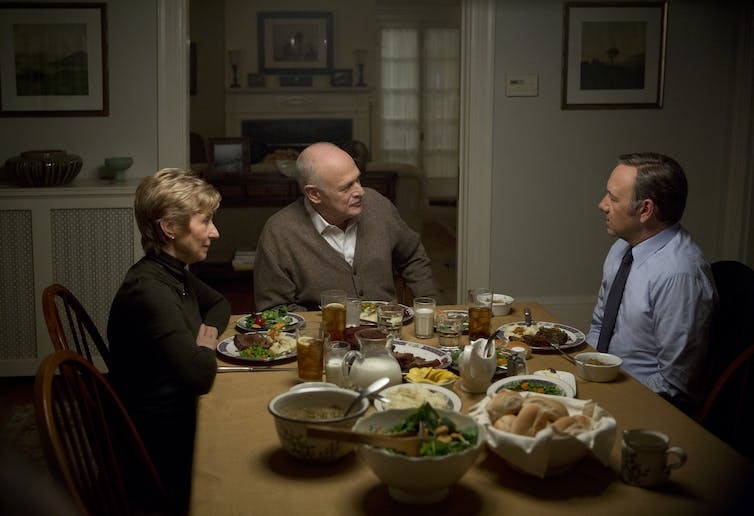 James Poniewozik’s review of season one for Time makes no bones about Underwood’s predilection for animal flesh; the man, according to Poniewozik, “likes him some meat”. Meat eating is strongly connected to concepts of power and masculinity. In fact, French philosopher Jacques Derrida questioned whether an openly vegetarian head of state was even imaginable. A quick look at some recent American presidents and their dietary habits seems to confirm this. Bill Clinton, a notorious consumer of women, whose extra-marital affairs while in office led to his impeachment, also had a great appetite for artery-clogging red meat. Now a high-profile vegan, Clinton is a reformed character, who has seemingly renounced hypermasculinity and was there to support his wife’s 2017 presidential campaign. Meanwhile, Barack Obama, a self-proclaimed feminist who once stated that his favourite food was broccoli – a vegetable hated by George Bush Jr – has been succeeded by an openly sexist president, who favours overdone steak and infamously tweeted “I love Hispanics!” while digging into a beef taco. Given the carnivorous trend of the US presidency, it is unsurprising that food is a significant metaphor in the “lethally addictive” House of Cards. On his journey to the Oval Office, Underwood’s eating rituals and food choices serve as metaphors for his control. 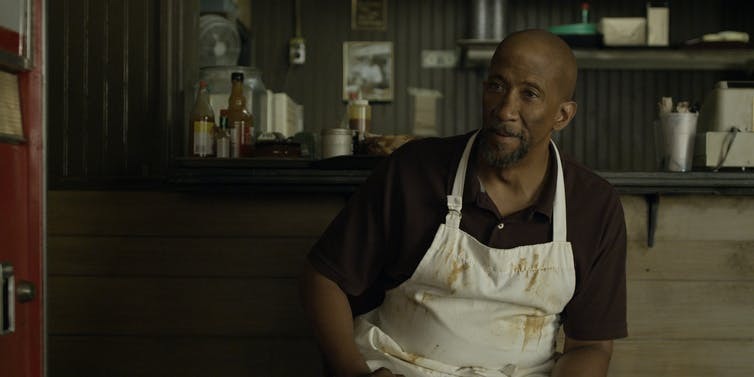 The BBQ-rib breakfast he devours at the end of the first episode sets the tone for the next couple of seasons, in which Freddy’s BBQ joint is an apt setting for various clandestine dealings. Freddie in his BBQ joint. Frank’s eating habits in the first two seasons mark him as the alpha-predator, the man at the top of the food chain who, while bolstering his own masculinity through his meat eating, uses vegetable food choices to emasculate those around him. When Remy Danton, Underwood’s former chief of staff, declares that he doesn’t eat pork, he is taunted by Underwood, who orders “half a rack” for himself “and some collard greens for my friend here”. Underwood repeatedly uses metaphors of food to reimagine other people as consumables which he devours to nourish himself. And the more painful the death, the more delicious the meal. This is brought home in a particularly brutal way when Freddy switches butchers to one who illegally supplies slow bled hogs, pigs that scream as they are processed, and Underwood revels in the improved taste. Underwood regularly makes a meal out of people, metaphorically cannibalising them. “I almost pity him. He didn’t choose to be put on my platter”, he comments when sabotaging Michael Kern’s play for chief of staff under President Walker, imagining how he will “carve him up and toss him to the dogs”. The speaker and the house majority leader are reimagined as fish with their “lightly salted faces frying in a skillet”. Linda Vasquez, Underwood’s pick for Walker’s chief of staff, might be “as tough as a two-dollar steak”, but that doesn’t stop Underwood eventually chewing her up and hastening her resignation in season two. Like other predators, Underwood satiates himself first, before feeding the lesser members of his flock, keeping them grateful and loyal subjects. Zoe Barnes, journalist and object of Underwood’s illicit sexual relationship is almost as hungry for power as he is, begs to be fed, as her texts to Underwood divulge: “What’s next on the plate?”; “Feed me”. Ultimately, she pays the price for her hunger, and is pushed under a train by Underwood after threatening to expose him. Underwood’s inauguration in season two marks a sharp drop in meat metaphors. Carnivorous behaviour functions as a marker of his hunger during his pre-presidential days; as sitting president his urge for meat is seemingly quelled. From now on sandwiches, salads and formal dinners abound, along with green apples, a bowl of which are regularly seen in the Underwoods’ kitchen. In the wake of Underwood’s physical vulnerability following an assassination attempt and subsequent liver transplant in season four, Underwood delegates much of his power to his wife. Claire Underwood has by this stage manoeuvred her way up to running mate in the build up to the election. Underwood, post-transplant surgery, then literally has a part of another human being inside him, keeping him alive. The ultimate form of cannibalism perhaps, and substitute for his voracious meat eating? While slicing an apple, he tells Claire it is she who will now have to steel her stomach. But anyone who thinks that Frank Underwood is now a reformed character along the lines of Bill Clinton is probably in for a disappointment. Underwood’s ability to adapt to circumstances only makes him more lethal, and we are looking forward to seeing who and what he will devour in this coming season.